There are different options you can use when setting up, joining, and presenting a Lync Meeting. These best practices help you take advantage of the features that make your job easier and provide a pleasant meeting experience. Tip: For an interactive guide to common presenter tasks, see Scheduling and preparing for a Lync Meeting and Managing your Lync Meeting. For a small and casual meeting with people inside your company, use the meeting default options and skip changing the settings. Remember that the default options let everyone be a presenter and join the meeting directly. Choose a backup presenter, in case you can’t join or are running late. A back up presenter can also start the recording, help and manage the audience, or monitor the questions submitted in the meeting, so you can focus on your presentation. This is especially important if you have a large meeting or event. Most of the time, you don’t need a PIN when you call in to the meeting with a phone. You get connected directly and your number shows up in the participant list. But, if you want to call in as the leader or an authenticated caller, you’ll be prompted for your PIN and/or work number or extension. Dialing in as an authenticated caller just means that the meeting is secured and you need to be identified before joining the meeting. If you’re inviting participants who aren’t familiar with Lync, include a How-to training document or link to the Lync training in the meeting request, to help them with the meeting features before joining the meeting. When scheduling your meeting, you can add private or shared notes using OneNote. Invitees can then view and edit the shared notes before the meeting, if they have appropriate permission. Just click Meeting Notes on the invitation ribbon, and add shared notes for the meeting requests, or your own notes (not visible to others). 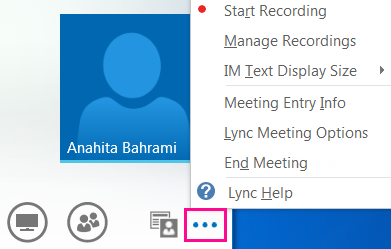 Tip: For an interactive guide to joining a Lync Meeting—including troubleshooting tips—see Joining a Lync Meeting. If you’re using computer audio, set up your audio and video devices and check the quality. You can use your computer’s mic and speakers, or plug in a headset. For more information, see Set up and test Lync audio and Set up and troubleshoot Lync video. If you’re using a phone for the meeting audio, take advantage of the LyncCall Me feature. On the Join Meeting Audio window, select Call me at and type the phone number you want to be called at. When you use this feature, you won’t need to enter the meeting ID or a PIN. Press *1 to hear a description of the available conference commands. After you join the meeting, mute your mic if you’re not speaking. See Use audio in a Lync meeting. Check the in-meeting options to make sure you’ve tuned off/on the correct audience features, such as attendee permissions, view content, or annotation permissions. Keep the slide deck to approximately 15 slides or fewer, with larger fonts (above 30 points), and a simple background to avoid distraction. Upload your presentation in advance and practice with the controls to move the slides or annotate. For example, you can call out important points by using the laser pointer or stamps. Use the presenter notes to help you remember your talking points. See Present PowerPoint slides in a Lync Meeting for more information. Keep in mind that when you’re sharing a program, only the programs and documents that you’re sharing are visible to attendees. If you browse to other programs, they won’t be visible in the meeting. Click Preview in the Lync Meeting to see what your attendees are seeing when you share Desktop or Program. For more information, see Share your desktop or programs in a Lync Meeting. Leave enough time for questions and let the audience know that they can type their questions or comments in the IM section of the meeting. Mute yourself when not speaking and make sure you know how to mute or unmute your participants if needed, both by using Lync, and phone touch tone commands if you’re using a phone (press *1 on your phone dial pad to hear the commands). At the end of the meeting, click More Options(…) and then click End Meeting. Click OK on the prompt to continue. This closes the window and disconnects everyone from the meeting, including those participants who called in. If you’re using the room projector, connect the cable to your computer and select the appropriate display. Duplicate – shows your desktop on both your computer monitor and the room projector. Extend – extends your desktop from your computer monitor and the room projector. Projector only – shows your desktop only on the room projector. We recommend selecting Duplicate so you can see the meeting both on your monitor and the room display.